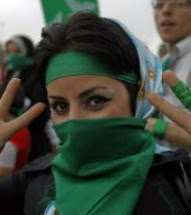 “A member of Iran’s notorious Basij militia who ran afoul of his superiors when he released two teenaged pro-democracy protesters says he was tasked with taking the virginity of young females sentenced to die. In an exclusive interview with the Jerusalem Post, the unnamed male described how, as an 18-year-old Basij recruit, he was tasked with taking the virginity of girls who were sentenced to die. Maybe also – a call to the Senate Foreign Relations Committee: (202) 225-3121 – Congressional Hotline – just ask for the above committee.